An international team of scientists developed the world's first antilaser for nonlinear Bose-Einstein condensate of ultracold atoms. For the first time, scientists demonstrated that it is possible to absorb the selected signal completely, even though the nonlinear system makes it difficult to predict the waves behaviour. The results can be used to manipulate superfluid flows, create atomic lasers, and also study nonlinear optical systems. The study was published in Science Advances. Successful information transfer requires an ability to extinguish selected electromagnetic signal completely, without any reflection. This might happen only when the parameters of the electromagnetic waves and the system around them are coherent with each other. Devices that provide coherent perfect absorption of a wave with given parameters are called antilasers. They have been used for several years in optics, for example, to create high-precision filters or sensors. The work of standard antilasers is based on the destructive interference of waves incident on the absorber. If the parameters of the incident waves are matched in a certain way, then their interaction leads to the perfect absorption with zero reflection. However, until now it was not clear whether such an absorption is possible in nonlinear systems, such as optical fiber transmitting high-intensity signal in strong external electromagnetic field. The problem is that it is much more difficult to describe the interaction of the incident waves propagating in the nonlinear medium. At the same time, nonlinear systems are interesting due to their capability of controlling wave frequency and shape without energy loss. This can be useful for signal distinction in optical computers. However, the problem is that nonlinear systems often turn out to be unstable and predicting their behavior can be difficult. In studying this problem, scientists from Russia, Germany and Portugal became the first to construct an antilaser for waves propagating in a nonlinear medium. 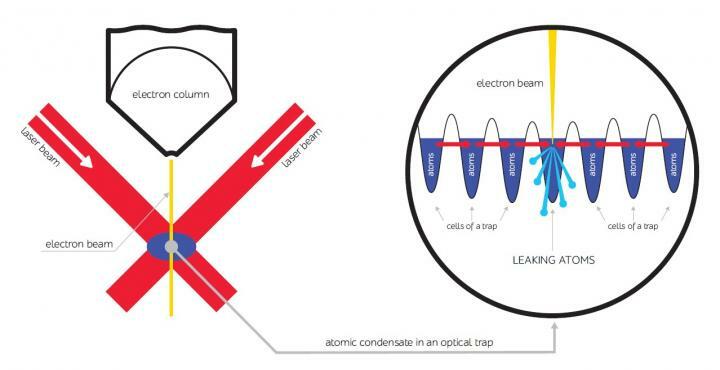 In their experiments, scientists used a Bose-Einstein condensate of ultracold atoms. Bose-Einstein condensate is a peculiar state of matter which can be observed when the atomic gas is cooled to extremely low temperatures close to the absolute zero. Under these conditions, a gas containing about 50,000 atoms condenses. This means that all atoms form a coherent cloud which supports propagation of matter waves. Strong repulsive interactions between the condensed atoms induce nonlinear properties in the system. For example, the interaction of waves ceases to obey the laws of linear interference. To catch the condensate, scientists use a periodic optical trap formed by the intersection of two laser beams. A focused electron beam applied to the central cell of the lattice makes the atoms leak out from this cell. Atoms from neighboring cells go to the central cell, striving to make up for the leak. As a result, two superfluid matter flows directed toward the center are formed in the condensate. Once the flows meet in the central cell, they are absorbed perfectly, without reflection. "The laws that describe the propagation of waves in various media are universal. Therefore, our idea can be adapted to implement an antilaser in other nonlinear systems. For example, in nonlinear optical waveguides or in condensates of quasiparticles, such as polaritons and excitons. This concept can also be used when working with nonlinear acoustic waves. For example, you can build a device that will absorb sounds of a certain frequency. Although such devices may not be made soon, we have shown that they are possible," notes researcher Dmitry Zezyulin, member of the International Laboratory of Photoprocesses in the Mesoscopic Systems at ITMO University. Scientists currently plan to shift to nonlinear optical systems, where atoms will be replaced with photons. "Photons, unlike atoms, are difficult to keep in the system for long. However, in this project, my colleagues managed to make a nonlinear atomic system behave as if it consisted of photons. At the same time, they managed to implement an ideal absorption in such conditions. This means that these processes are also possible in nonlinear photonic systems," adds Ivan Iorsh, the head of the International Laboratory of Photoprocesses in the Mesoscopic Systems at ITMO University.